Using a keyword tool Ive found some popular questions people ask about the amazing animated comedy The Simpsons. Most people agree over time it has lost its magic abit, but its still very good. How many seasons of The Simpsons has there been? As of 2016 we are in to the 27th Season. Which were the best seasons? The first 10 seasons are generally regarded as the best. December 17th in 1989 was the first ever episode. Has The Simpsons been cancelled? No! At least not at the time of writing this. For 2015-2016 Season 27 is running on Fox in the USA. 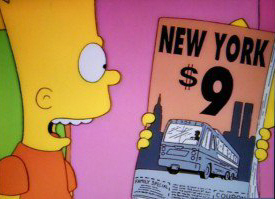 Did The Simpsons predict 9/11? Some say so, yes! It was in the episode “New York City Against Homer”. See this image. This question made me laugh! I think you can look at them to answer that one yourself. No. Admittedly they portray lots of human aspects of the human condition, but are definitely their own unique species! Like many animated characters they do not get older. Over such a long period of production subtle changes to happen, but no, normal ageing as we know it is not part of the production. Have they ever won an Emmy award? Definitely, many times in fact, at the time of writing this they have 32 Emmy awards! I hope this has increased your knowledge on this awesome program!